Regular PCD readers have been wondering where their morning blog posts are. Not to worry, I’m on hiatus for the month of November recharging my batteries and brain. PCD has brought you polymer goodies daily since 2005 with occasional time off for good behavior. This week we visited Kim Korringa in her new home and studio. What a treat! 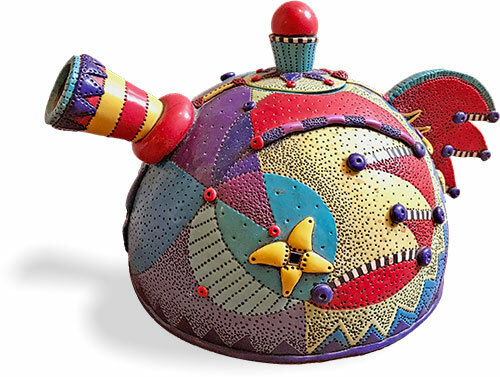 This Rebecca Zimmerman teapot from the late 90’s is in Kim’s great collection of works. If you can’t bear to miss out any longer, click on over to studiomojo.org for the weekend catch up and insiders’ view. PCD will resume its usual daily early morning coffee schedule in December. You deserve it, thanks for all you give and do Cynthia! Enjoy the difference of this month Cynthia. I fly out to Nepal today so will be enjoying a different month too! Big hugs. Thanks for the fantastic pictures and info you give us all! Your blog is a bright spot in my day. Enjoy your rest.